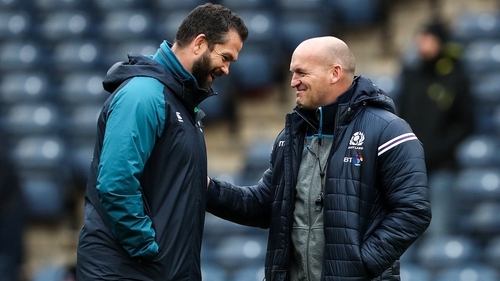 Scotland coach Gregor Townsend says he doesn't believe that Saturday's defeat to Ireland will have much bearing on the sides' World Cup meeting. The Pool A rivals meet in their opening game in Yokohama on 22 September, knowing that the top team in a group that contains hosts Japan, Russia and Samoa, is likely to avoid back-to-back world champions New Zealand in the quarter-final. "I don't think so," said Townsend when asked if the 22-13 loss in Edinburgh would have a bearing. "I was talking to Andy Farrell [Ireland defence coach] before the game and we were talking about how Yokohama feels like another world. Scotland skipper Greig Laidlaw added that he felt his team are improving but that their focus is still on the Six Nations. "I think we are on a really good development track," said the Clermont scrum-half, who kicked eight points on Saturday. "I think we're almost there in one sense. We've been playing some tremendously good rugby, we've scored an awful lot of tries. We just need to fine-tune the last few bits but we're really not looking towards the World Cup at the moment. "It's vitally important we turn this around and go to France and get a win. If we win in France we're still in the competition."